"Dove" and "pigeon" redirect here. Pigeon and dove are common names, often used interchangeably, for the generally short-billed, small-headed, short-legged, plump birds comprising the widely distributed family Columbidae within the order Columbiformes. 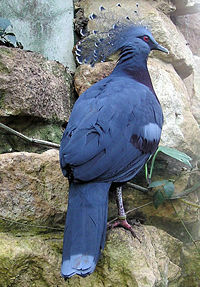 These birds also are typified by monogamous mating behavior, a characteristic cooing call, use of "pigeon's milk" to feed their young, and specialized bills that allow the steady sucking up of water. The short slender bills have with a fleshy cere (swelling) near the nostrils. In ornithological practice, there is a tendency for "dove" to be used for smaller species and "pigeon" for larger ones, but this is in no way consistently applied, and historically the common names for these birds involve a great deal of variation between the term "dove" and "pigeon." The species commonly referred to just as the "pigeon" is the feral rock pigeon or rock dove (Columba livia), common in many cities. This family occurs worldwide, but the greatest variety is in the Indomalaya and Australasia ecozones. In addition to various species of Columbidae being used by humans for food and to carry messages, the dove has offered considerable symbolic value. In particular, white doves have been used as a symbol of love and peace, as well as the Holy Spirit in the Christian faith. On the other hand, the extinction of the passenger pigeon is a well-known example of human over-exploitation. This species once numbered in the billions in North America, living in enormous flocks, but declined catastrophically in the face of severe hunting pressure for food. Columbidae is the long extant family of the Columbiformes order, with also includes the extinct family Raphidae with the Dodo and the Rodrigues Solitaire and Réunion Solitaire (Crome 2004). Like many birds, all Columbiformes are monogamous; that is, they have only one single mate at a time. Unlike most other birds, however, they are capable of drinking by sucking up water, without needing to tilt the head back. The members of the family Columbidae have stout bodies with short legs, small heads, short necks, and heavy plumage. They have short and slender beaks, with two holes (nares or nostrils) that connect to the hollow inner beak and thus to the respiratory system. As with hawks, parrots, and budgerigars, the nostrils of doves and pigeons are located in a fleshy, often waxy structure called the cere (from Latin cera). The young doves and pigeons are called "squabs." Doves historically have had considerable symbolic value to various cultures, have served to carry messages, and also have served culinary interests. White doves, usually meaning domesticated rock pigeons, are a traditional Christian and Jewish symbol of love and peace. According to the biblical story, a dove was released by Noah after the flood in order to find land; it came back carrying an olive branch in its beak, telling Noah that, somewhere, there was land. A dove with an olive branch has since then come to symbolize peace. In Christian iconography, a dove also symbolizes the Holy Spirit, in reference to Matthew 3:16 and Luke 3:22 where the Holy Spirit appeared as a dove at the Baptism of Jesus. Doves or other birds are sometimes released at Christian weddings. They are generally the valued property of individuals who provide them specifically for this purpose. They are regularly permitted to fly free from their home dove cotes and therefore know very well how to fly back home after leaving the scene of the marriage ceremony. 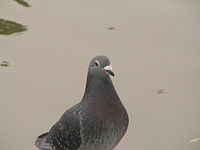 All rock pigeons are capable of homing over such short distances, but occasionally birds may be distracted by finding a mate or be caught by a predator. Rock pigeons selectively bred for their ability to home over long distances, called homing pigeons, have served humans in times of war as war pigeons, and have even been awarded war medals to honor their services to humanity. These include the homing pigeon, Cher Ami, who received the French Croix de guerre for services during wartime, and who is now enshrined in the Smithsonian Institution, and G.I. Joe, who received the Dickin Medal for his role in preventing the bombing of an Italian village of over 1,000 people. 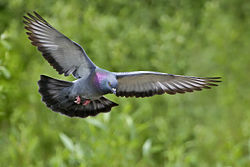 Several species of pigeon or dove are used as food, and probably any could be; the powerful breast muscles characteristic of the family make excellent meat. In Europe, the wood pigeon is commonly shot as a game bird, while rock pigeons were originally domesticated as a food species, and many breeds were developed for their meat-bearing qualities. Doves are Kosher, and they and turtle doves are the only birds that may be used for a Korban. Other kosher birds may be eaten, but not brought as a Korban. Doves and pigeons also offer aesthetic beauty, with their diverse colors and patterns. The extinction of the passenger pigeon (Ectopistes migratorius) is a common example of human over-exploitation. The passenger pigeon or wild pigeon was a species of Columbidae that was once the most common bird in North America. It is estimated that there were as many as five billion passenger pigeons in the United States at the time Europeans colonized North America. They lived in enormous flocks, and during migration, it was possible to see flocks of them a mile (1.6 km) wide and 300 miles (500 km) long, taking days to pass overhead. The primary factor in their decline emerged when pigeon meat was commercialized as a cheap food for slaves and the poor in the nineteenth century, resulting in hunting on a massive scale. By 1914, they were extinct. The Columbidae family is a highly coherent group with no members showing obvious links with other bird families, or vice versa. The dodo and solitaires are clearly related, but equally lacking in obvious links with other bird families. The limited fossil record also consists only of unequivocal Columbidae species. Links to the sandgrouse and parrots have been suggested, but resemblances to the first group are considered due to convergent evolution and the second depend on the parrot-like features of the tooth-billed pigeon. However, the distinctive features of that bird seem to have arisen from its specialized diet rather than a real relationship to the parrots. The family is usually divided into five subfamilies, but this may be inaccurate. For example, the American ground and quail doves, which are usually placed in the Columbinae, seem to be two distinct subfamilies. Basically, the conventional treatment had 2 large subfamilies, one for the fruit-doves, imperial pigeons and fruit-pigeons, and another for nearly all of the remaining species. Additionally, there were 3 monotypic subfamilies, one each for the genera Goura, Otidiphaps, and Didunculus. The old subfamily Columbinae consists of 5 distinct lineages, whereas the other 4 groups are more or less accurate representations of the evolutionary relationships. The order presented here, with nine subfamilies, follows Baptista et al. (1997) with some updates (Johnson and Clayton 2000; Johnson et al. 2001; Shapiro et al. 2002). In addition, some would include a subfamily Raphinae, with the the dodo and Rodrigues solitaire, rather than placing them in own family, pending better material evidence of their exact relationships. The dodo and Rodrigues solitaire are in all likelihood part of the Indo-Australian radiation that produced the 3 small subfamilies mentioned above, with the fruit-doves and pigeons (including the Nicobar pigeon). Note that the arrangement of genera and naming of subfamilies is in some cases provisional because analyzes of different DNA sequences yield results that differ, often radically, in the placement of certain (mainly Indo-Australian) genera. This ambiguity seems to confirm that the first pigeons evolved in the Australasian region, and that the "Treronidae" and allied forms (crowned and pheasant pigeons, for example) represent the earliest radiation of the group. Exacerbating these issues, columbids are not well represented in the fossil record. No truly primitive forms have been found to date. The genus Gerandia which most likely belongs to the Columbinae has been described from Early Miocene deposits of France. Apart from that, all other fossils belong to extant genera. Emerald Dove, Chalcophaps indica, native to tropical southern Asia and Australia. Luzon Bleeding-heart Pigeon Gallicolumba crinigera, native to the Philippines. Victoria Crowned Pigeon Goura victoria in Bristol Zoo. 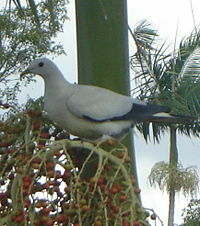 Pied Imperial Pigeon Ducula bicolor. Kererū (New Zealand Pigeon), Hemiphaga novaeseelandiae. 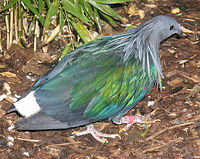 Wonga Pigeon, Leucosarcia melanoleuca, native to Australia. Baptista, L. F., P. W. Trail, and H. M. Horblit. 1997. Order Columbiformes. In J. del Hoyo, A. Elliott, and J. Sargatal, eds., Handbook of Birds of the World, Volume 4: Sandgrouse to Cuckoos. Barcelona: Lynx Edicions. ISBN 8487334229. Crome, F. H. J. 2004. Columbiformes (pigeons, doves, and dodos). Pages 241 to 246 in M. Hutchins, D. A. Thoney, and M. C. McDade, eds. Grzimek's Animal Life Encyclopedia, Vol. 9: Birds II. 2nd ed. Detroit: Gale. 17 vols. ISBN 0787653624. Gibbs, D., E. Barnes, and J. Cox. 2001. Pigeons and Doves: A Guide to the Pigeons and Doves of the World. Robertsbridge: Pica. ISBN 1873403607. Johnson, K. P., and D. H. Clayton. 2000. Nuclear and mitochondrial genes contain similar phylogenetic signal for pigeons and doves (Aves: Columbiformes). Molecular Phylogenetics and Evolution 14(1): 141–151. Retrieved November 3, 2007. Johnson, K. P., S. de Kort, K. Dinwoodey, A. C. Mateman, C. ten Cate, C. M. Lessells, and D. H. Clayton. 2001. A molecular phylogeny of the dove genera Streptopelia and Columba. Auk 118(4): 874-887. Retrieved November 3, 2007. Shapiro, B., D. Sibthorpe, A. Rambaut, J. Austin, G. M. Wragg, O. R. Bininda-Emonds, P. L. M. Lee, and A. Cooper. 2002. Flight of the dodo. Science 295: 1683. Retrieved November 3, 2007. This page was last modified on 5 November 2008, at 03:58.